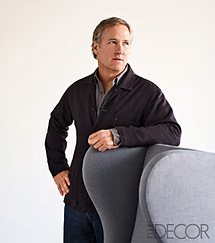 Weather designing a Manhattan townhouse, a beach house getaway or a Northern California residence, Ford Huniford blends new and old, uniting found objects with refined materials in distinctive combinations and vignettes. Be it the circular repetition of oversized gears or the gentle curve of a whalebone, one-of-a-kind objects inspire all of Ford Huniford's designs. His signature use of calming colors highlights the importance of objects, art, and furniture, as a canvas does for a painter.